This Old Navy babydoll dress is carefree, comfy, and perfect for transition weather. I paired my look with a pair of ankle boots for afternoon running around, but tried this dress with a pair of flat, over the knee boots and it was SO cute. Cannot wait to rock that look with tights when the temps are a bit chillier. I am pretty much hat obsessed during the fall and winter months, and since I try to only wash my hair two to three times a week, they are the perfect go-to and put the perfect finishing touch to a simple dress like this. 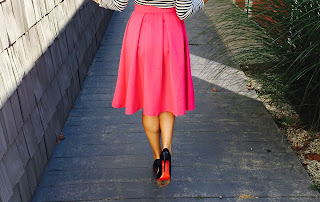 This is an easy look, and perfect for early fall weather that anyone can wear!